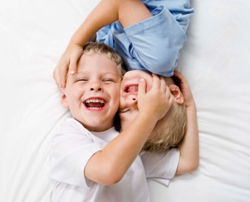 Pediatric Dental Services | Eastern Long Island, NY | Joseph F. Sciotto D.M.D. If you have children, you most likely are aware of the importance of early detection and treatment of any type of dental condition. Joseph F. Sciotto D.M.D., and the Academy of Pediatric Dentistry, recommends that your child visit the dentist by his or her first birthday. In fact, the earlier that we begin to see your child the more comfortable he or she will feel when they visit our office.